Ever wonder why Santa Claus wears a red and white suit, owns flying reindeer and works with magical elves? Researchers believe these are examples of the influence of psychedelic mushrooms on Christmas tradition. Ethnobotanist and mystic Terence McKenna says, “An example of how a very ancient folkway being incorporated into our culture without even realizing it is provided by discussing Amanita Muscaria.” Amanita muscaria is a red and white colored psychoactive basidiomycete fungus and mushroom with potent hallucinogenic properties. 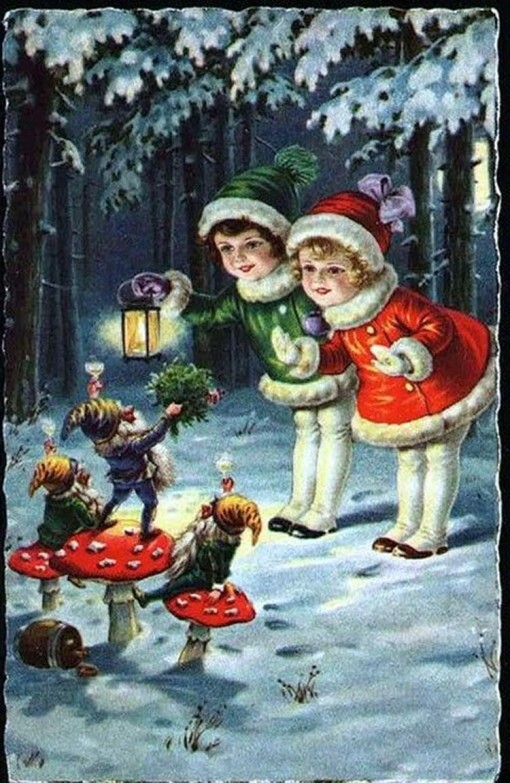 Popularized images of Amanita muscaria in faery tales and books like Alice in Wonderland had their origins in tribal belief systems pre-dating Christianity. Psychedelic mushrooms played a central role in pagan cultures throughout the Northern Hemisphere such as the Koyak tribe of the central Russian steppes and the Lapps of Finland where the mushrooms grow. These tribal cultures believed in the mythology of the World Tree, whose roots span the underworld and branches reach towards heaven, touching the North Star. The tradition of decorating a pine tree is symbolic of this World Tree, and the star placed at the top represents the North Star. The spirit of the shaman would climb this tree, thus gaining access to the realm of the gods. The World Tree was seen as a kind of cosmic axis, or an axis mundi world center connecting Heaven and Earth. On Earth, the axis mundi is located at the poles. 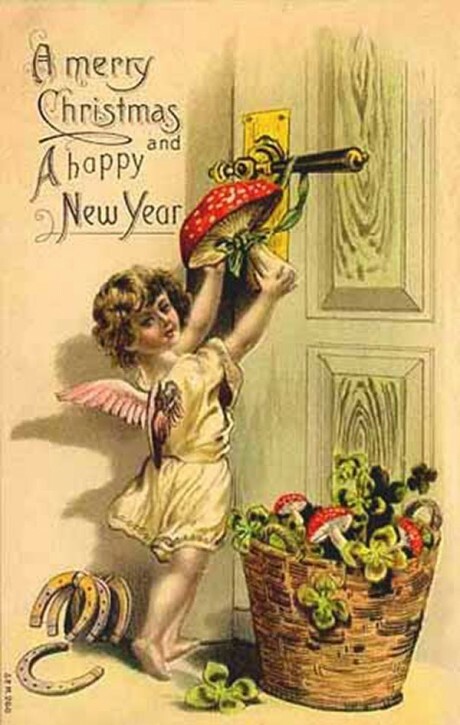 Traditionally, mushrooms were dried for consumption by hanging them on pine tree branches to catch the sunlight or, they were hung in front of the fireplace. Both of these methods have become symbolized by hanging ornaments on a pine tree and hanging (red and white) stockings on the fireplace. Northern shamans, like Santa himself, dressed in red and white hooded robes, emulating the colors of their sacred mushroom. 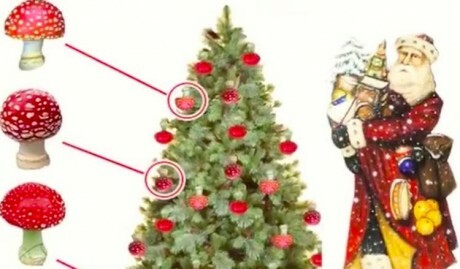 Describing the DMT trip, McKenna say’s, “The air appears to suddenly have been sucked out of the room because all the colors brighten visibly, as though some intervening medium has been removed.” This may explain the symbolism behind lighting a Christmas tree. A tree is, in essence, luminous electromagnetic energy, but this is only perceivable under the influence of psychedelics. There is evidence that Christianity itself was influenced by Amanita muscaria. In his book The Sacred Mushroom and the Cross (1970), John M. Allegro makes the claim that Jesus did not exist as an historical figure but was code for Amanita muscaria, a code invented by early Christians tripping on psychedelic mushrooms. Though disparaged at the time, Allegro’s theories are now being re-evaluated, in light of new evidence, and his books are back in print. Inspired by Allegro, cannabis activist and author Jack Herer painstakingly interpreted biblical text as mushroom cipher. According to Herer, the Middle East was not always a desert and millions of cedar trees once populated Lebanon. He cites an obscure “crusade against the Cedars of Lebanon” which dwindled the population down to a mere 400 trees. Botanists have misclassified the “cedars” of Lebanon, which Herer asserts are actually members of the pine family. And of course, it is the pine which shares a symbiotic relationship with Amanita muscaria. Herer points out that early Christian paintings depicting religious figures had halos drawn around the head with radial lines emanating from the head. This image resembles the underside of a mushroom and symbolizes these were enlightened individuals under the spell of the mushroom.